Before I picked up this book, I saw it everywhere on the online book community. Whilst I never delved deeply into the reviews, I was intrigued enough by the premise to pick the books. Knowing this book was dealing with the sensitive issue of teenage suicide, I went into this book prepared for a solemn read. I can't help but walk away feeling disappointed. The beginning chapter was perhaps the strongest aspect of the novel. It was an excellent hook that dragged me in and made me intrigued to find out what exactly happened to Hannah. Knowing the aftermath, you as a reader cannot help but wonder about the events leading up to it. However, sadly, that was perhaps the only aspect of the novel I enjoyed. I really wanted to like this book. Believe me, I tried really hard to objectively identify what worked for this book and what didn't. I tried to recognize what I didn't like about the book and see it from a different angle. But at the end, I really just couldn't convince myself that I enjoyed this book. Suicide is an insidious thought that creeps up on the individual. It is irrational. It is often not a spur-of-the-moment decision. People who are driven to the edge often do not see any other option left for themselves. I didn't have any problems with most of the reasons she listed as having contributed to her ultimate decision. However, I did not get any vibes of despair or misery whilst reading this book. Hannah's tone was very accusative and seemingly blaming those around her for pushing her into doing what she ended up doing. She seemed overdramatic, resentful at times, almost gleeful in how she had planned every tape meticulously and was only feeding the listeners bit by bit. "Hannah Baker here. Live and in stereo. No return engagements. No encore. And this time, absolutely no requests." Basically, if they wanted to know why they made the list, well, they better listen up. And once you have an unlikeable protagonist, it becomes a struggle to push through with the rest of the book. 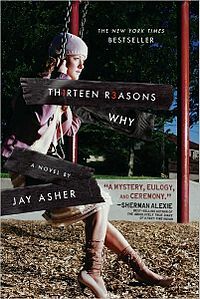 I can understand the direction that Jay Asher tried to take with this book. Sometimes, you can never pinpoint the exact underlying reason of someone's suicide. It can be an accumulation of little stuff that most of us would brush off but for someone else, that combination under those circumstances is unbearable. However, Hannah was just so unrelateable that I didn't understand the rationale behind her interpretation of the events. Another aspect of this novel I struggled with was the constant back and forth between the two main characters. There have been times where I couldn't differentiate between Clay and Hannah as the alternative POVs changed so fast. I appreciated the thoughts behind the construction of this book. But the execution fell short and I found more things that I disliked than I enjoyed. I'm going to chalk this one up as another book that was hyped up more than it deserved to be. Read at your own risk. Awesome review. I totally agree. I hated Hannah so much that I struggled to get through this book. She was just too vengeful for me.